Release of Soul Discovery Tomorrow. Almost There! Anyone who knows/follows me on social media is probably sick of hearing about my writing a book, especially when it’s taking a millennia to be real. Once I signed with Booktrope Publishing my hobby became a second job and “advertising” my progression through the trenches came with hesitance and excitement, so hopefully only a few have added me to their hit lists. A year after signing with BT (maybe more than a year…definitely more…Gah!) 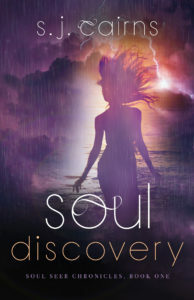 it has taken me to get my first book SOUL DISCOVERY, SOUL SEER CHRONICLES ready. Which sounds like it was a POS to begin with, maybe so, but she’s shiny and ready for release tomorrow. Holy fuckbuckets full of demon tears, I’m releasing a novel, TOMORROW. With a career devoted to helping others through their struggles, I sought out a dose of fantasy and stumbled upon a drive to weave stories while utilizing my experience to craft characters. To see them on pages like so many on my personal shelves, pages I can touch and smell (you know us crazy readers and our book huffing issues), was a dream and now soon-to-be a reality. The publishing process is a whole separate animal equipped with jagged teeth and claws on the body of a snarling multi-headed monster, a.k.a. my writing team. (Jokes, love you guys). And I haven’t even been released yet. Next is me hiding under my writing cape and forcing myself not to check sales numbers and dodging hazards I’m sure my Book Manager hasn’t warned me about yet. That’s okay, I love it. I love words and the feeling of when a story idea comes together. Being published is like being able to eat all the foods I’m allergic too without dying; a rush while flipping Death the bird. And I plan on enjoying it. While I’m cheating death and hunkering down to get book 2 ready for consumption, you can follow the link I’ve peppered all over social media and now here, yes again, and order a copy of your own in either ebook or paperback. Keep an eye out for future signing events, I’m sure I’ll be around somewhere, looking awkward and hopefully able to answer the question “What’s your book about?” without starting with “Ummmm”. No promises.